Below are some basic beekeeping methods of swarm control, how and when to feed your bees and tips on making up a nucleus, and queen rearing to help get you started. They are suggestions only and are far from exhaustive. Please check out our Book Section for further reading and available information. To gain further experience and advice we strongly recommend joining your local Beekeeping Club or Association. There will always be members who will be only too happy to help and guide you. Contact details and addresses can be found on the British Beekeepers Association website or check out our Links Page. There are many methods of swarm control and so far non have proved to be perfect, so do not be too disillusioned if your chosen method doesn't work every time, we have all, at some time lost a swarm. In this simple basic method that we include here, you are actually producing an artificial swarm situation. Throughout the swarming season, which in the UK is usually during May - July, the bee colony should be inspected regularly every nine to ten days. On these occasions a thorough check for any queen bee cells should be carried out. If any are discovered the first procedure is to find the old queen, once found, the comb on which she is situated should be removed, making sure she remains on the comb. If there are any other queen cells on this comb they should be destroyed. This comb with the queen still present must then to be placed in the centre of a new brood box and the remaining space filled with drawn comb or foundation. The next procedure is to remove the old brood box and floor and reposition them a few feet away (3' to 6' is sufficient) with the entrance facing a slightly different direction than originally. A new floor should then be placed on the site of the old hive and the new brood box containing the old queen should then be placed on this. A queen excluder should then be placed on this and any supers from the old hive should now be placed on top and the crownboard and roof replaced. What you now have is the old queen in a new brood box with only one frame of brood, no queen cells and plenty of space. All the flying bees that are out foraging will return to this hive as it is in the position that they know and are accustomed. Having undertaken this much of the procedure the old brood chamber must now be thoroughly inspected for any sealed queen cells, any being found should be cut out and destroyed. It is recommended that two unsealed queen cells containing larvae and plenty of royal jelly, well positioned centrally on the comb, be selected and left, although I personally prefer to leave three. Mark the tops of the frames containing these cells in some way, drawing pins or pen, replace any missing frames and close up the hive. If the combs contain plenty of food no further action is required but if not feed with sugar syrup as required. After five days carefully inspect the combs by which time the chosen queen cells should be sealed. If this is the case check for any other cells that may have been started and destroy them. After this check, the colony should be closed up and left alone for a period of three weeks. This procedure is best carried out in the evening when most of the flying bees are in their respective hives. Go to the colony containing the new queen, remove the roof and crownboard. Place a double layer of newspaper (the bees seem to enjoy the financial times best!) 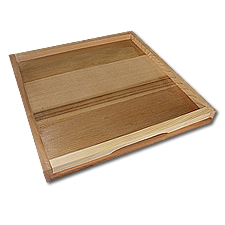 on top of any supers, if any are there, held in position with a queen excluder, if not, on top of the brood box, make a few small slits with your hive tool in this paper. Take the brood box with the queenless colony and place this carefully on top of the queen-right colony with the paper in between. Make sure the paper is not broken, moved or folded over. Place the crownboard and roof back on top and leave alone. Check the following morning and if a pile of newspaper pieces is outside of the hive entrance and very few dead bees, you have successfully united your colonies. Leave alone for one week after which time the combs in the two boxes can be re-arranged and sorted to form an organised brood nest. If all the bees will fit into one brood box the the top brood box can be removed. At this time of the new season the activity within the colony starts to increase. The brood nest will start to expand and the demand for Pollen and Water will dramatically increase. Make sure that a clean supply of water is available close to the colony as a bee drinking very cold water will get chilled and may not make it back to the hive if a large distance has to be travelled. A shallow bucket or container containing pebbles with the water just below the top of them works quite well. A good sign will be many bees entering the hive carrying pollen, a fair sign that the queen is active and increasing her laying. However, the down side is that the food stores will start to diminish rapidly and a careful watch should be kept to make sure colonies do not starve. If a colony appears to be running low on food stores they should be fed with sugar syrup, mixed to the proportions, 2lbs of white sugar to one pint of water. This should be fed in a contact or rapid feeder, an Ashforth or Millar feeder is not recommended at this time as the bees get chilled and never seem to take the syrup very well. It is quite normal to find a number of dead bees outside the hive entrance at this time of year as the bees clean-up after the winter, but if the numbers seem excessive, send a sample to your local Microscopist or Regional Bee Inspector for testing. During the mid part of April if the weather is warm a brief inspection of the brood can be made but be very careful and do not remain for longer than is necessary. Mouseguards can now be removed and entrances restricted with entrance blocks with an approx. 100mm - 130mm x 6mm (4"- 5" x ¼") opening in an attempt to maintain warmth, although you should watch for a build-up of moisture. If your colonies appear to be O.K. they can generally be safely left alone until early May when a more thorough examination will have to be undertaken. On this occasion any old combs should be removed from the brood chamber and replaced with new foundation and, or, frames where needed. Floors can be cleaned or changed and Propolis removed from frames and hive parts. Check combs for signs of any disease and check to see that the queen is present and laying. If the brood is occupying four or five frames and the bees are spread to the outside frames in the brood box, place a queen excluder on top followed by a super - this first one preferably filled with drawn comb but if not available foundation will suffice. Into a large saucepan pour one pint of water and bring this to the boil. When this is boiling steadily stir in 6lbs of white sugar, reduce the heat and stir continuously until all of the sugar is dissolved. Now, add half a teaspoon of cream of tartar, stir in, and now increase the heat, stirring all the while. Bring once again to the boil, still stirring. Using a cooking thermometer, continue until the temperature reaches 240°F / 116°C. Remove the pan from the heat and place in a pan or sink of cold water and allow to cool to between 120°F and 140°F / 50°C and 65°C, continue to stir vigorously and as soon as the mixture starts to stiffen pour quickly into container. To feed to your bees, place the candy, still in the container, upside down over the opening in the crownboard, covering with some baking foil and cloth to keep it warm for as long as possible. Check regularly, giving more if needed. Of course you can purchase our own prepared if you wish. You will need an extra Brood Box or a to carry out this proceedure. This is a very simple and basic method for rearing a new queen to replace an existing failing queen or to produce a Nucleus. There are many other methods. Spare Hive or Nucleus Hive. A frame of drawn empty brood comb (an empty super frame of drawn empty comb will be OK if brood not available). A brood comb of sealed Honey stores. A brood comb of a fair portion of Pollen. From the drawn empty comb cut out a square of comb about 25mm. From the hive that you have selected as donor hive/queen find a comb containing eggs and newly emerged larvae (it is important that some larvae are present). Using a bee brush very gently brush the bees off the comb and into the hive. Quickly cut a square of comb from the area containing the eggs/newly hatched larvae to correspond with the size of the square previously cut from the empty comb. Take your first square piece of empty comb and fit it gently into the hole you have just cut from the breeder comb. Make sure it is the correct way up. Replace this into the hive. Now fit your piece of breeder comb with eggs and larvae into the empty drawn comb and place between the stores and pollen comb and place these into your Nucleus Hive. Now select four frames of bees, either all from one or several hives (making sure you find the Queen in each of the selected hives and placing into a match box for protection) and shake as many of the bees as possible into the Nucleus Hive, making sure as many nurse bees as possible go in, as many of the older bees will fly home to their original hive. Now replace any removed queens back into their respective hives. The bees should now draw one or more emergency queen cells and with no other brood to care for the nurse bees will raise a good new queen. The new queen should emerge in 13 to 14 days and all being well be mated by the 24th day. Once you are happy with your new queen use her according to your requirements. Any brood combs may now be returned to the hive/s of origin. This method may also be used to re queen a queenless colony that has been queenless for more than 7 days and any subsequent cells being destroyed.